For the fifth summer in a row, I set aside time for discipleship...for passing on faith and femininity to my favorite girl. It's not as if SUMMERtime is the only time I do this. Summer just brings about a looser schedule and with it, the opportunity to invite a few other young ladies to join us in our fun. It provides moments of intentionality...of purpose. This year, Sweetie Pea and I extended an invitation to ANY teen girl who wanted to join us. I didn't want to limit our group to just our current social circles. I wanted to open our doors and our hearts to new girls in our church and in our community...girls that needed to connect...girls that needed to know God's love. And so, we invited ANY and ALL tween girls to join us...or at least as many as would fit in my tiny dining room...that would be seven. In year's past, our summer club has been a grand affair complete with snacks, decorations, and dress-up. But, since we currently have our house for sale and need to maintain a certain level of...well...cleanliness...,I knew I needed to keep this year's meetings s.i.m.p.l.e. Inspired by a few art journal tutorials I had recently seen, I welcomed the girls over one night a week for a month and a half to create a faith journal that would point them to God and His love for them. Since the majority of the girls had never met, we spent the first few minutes of our first meeting playing a simple mixer called "Top 3". Prepare a slip of paper for each player. On the top of each slip of paper write a "Top 3" theme or list suggestion such as "My top 3 favorite books" or "My top 3 favorite things to do in the summer". Then, write the numbers 1-3 in a list format down the left side of the slip of paper. Each slip should have a different Top 3 theme to it. Pass out a pen and one Top 3 slip of paper to each player. Encourage each girl to read her theme and then write down her top 3 items that fit that theme. When everyone has finished writing down their top 3, go around the room and allow everyone to introduce herself and give the answers...and only the answers...to her Top 3. After a list of Top 3 is given, invite the other girls to guess what they all think the "theme" of the list is. Example: A girl might say, "Hi! I'm Sarah and my Top 3 are eating a cookie as big as my face, visiting my Aunt in Florida, and winning a new bike in the library reading program." The other girls might then guess things like "The Top 3 things you dream about doing" or "The Top 3 favorite things about the summer" or "Your Top 3 goals for the upcoming year"
There really is no winner or looser to this game. It's just a way to learn a few things about each of the girls in the group and possibly open the door to further conversation. We would create one GLAM Book page and embellishments. Embellishments might include tags, book marks, beaded page dividers. As one section of the page was drying, I would read the week's theme and theme verse and we would discuss them...very informally. I wanted to guide the conversation, but also allow all the girls to be able to share their thoughts openly. We would add glam (glitter, stickers, jewels, buttons, etc) to the painted or decoupaged page. If the page was dry enough, we would write the week's theme and theme verse onto the page leaving plenty of room for faith journaling later. If the page was still wet, we would begin the next meeting with this step before moving on to the next page. 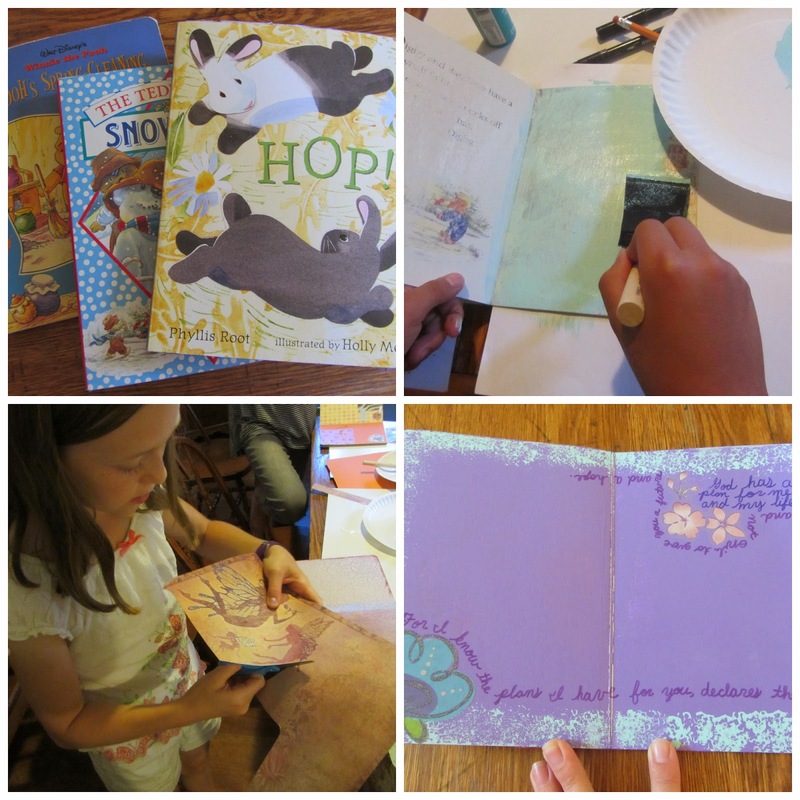 Using scrapbook paper, paint, stickers, and all kinds of embellishments, we transformed a half dozen board books that I had picked up at our library used book sale into faith journals...or GLAM Books. (In case you're curious, GLAM stands for God's Love and Adoration for Me. Yep...I totally made that up in order to give our faith journals a tweenish name for the club. But it works because it's true!) It is my hope that these books will be filled with verses, prayers, and love letters of thanksgiving to God. Each page of the GLAM Books had to be lightly sanded in order to create a matte surface with which to paint or decoupage. 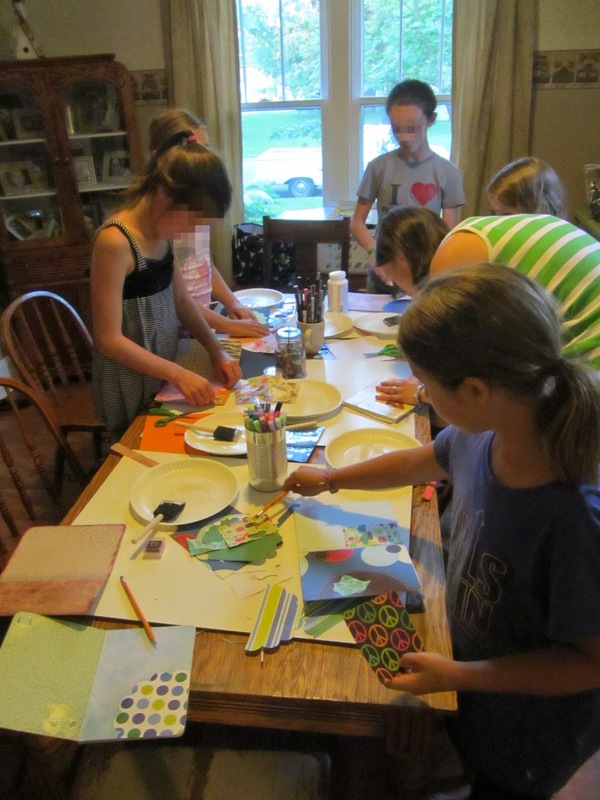 Although some of the girls chose to maintain a continuous color scheme throughout their books, most of the girls opted to make each page unique. Should you decide to make a GLAM book of your own, I highly recommend putting a piece of scrap paper under each of the pages you are currently working on so that the paint from your current page does not bleed over the edge and onto your previously create pages. There really is no ONE way to make an art journal, and consequently, no ONE way to make a GLAM book...just be sure to add lots of glam! I have no idea HOW God will use our short time together in the lives of these girls. But, I pray that these GLAM books will be a long-lasting reminder to them of His love and their worth. I am so grateful to have had the help of a dear blog reader-turned-friend who graciously volunteered to help me each week. Sweet friend...you know who you are..., homeschooling may have brought us together, but a love for God and our girls has built a foundation for a friendship that the Author had written long before we ever met. May we always be iron sharpening iron to each other and to our girls! I have been following your blog for a while. I love God's girls club. As I have been reading other comments, looks like most mom's would liketo do one. 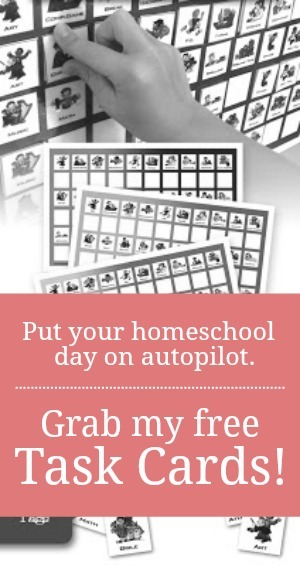 Just an idea, why don't you conduct a roll call and have mom's connect to each other through on the city/state they live in, so we could connect and do this . 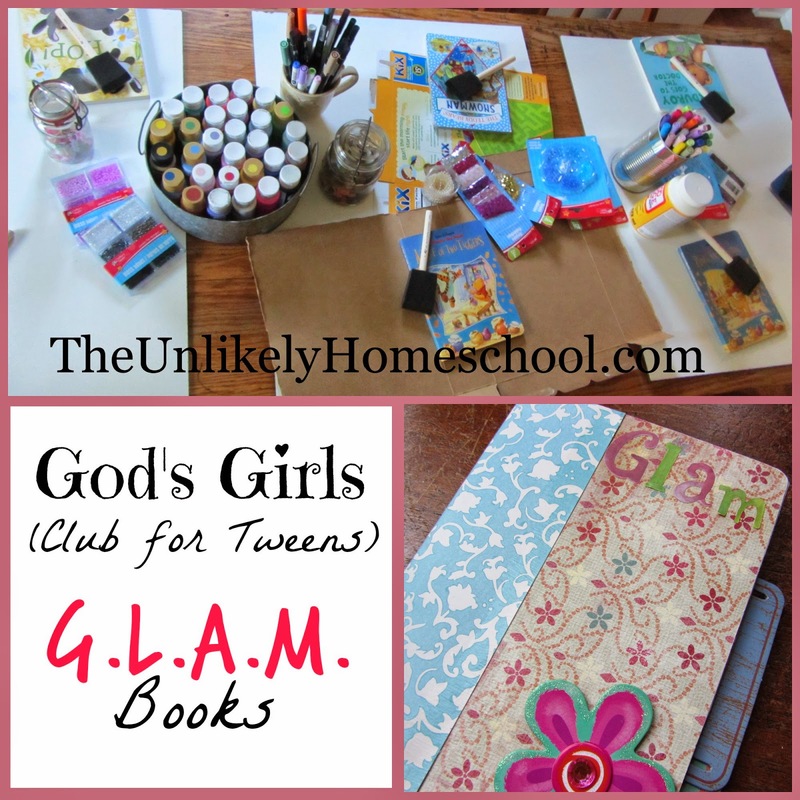 I've been doing a tween club for girls at church and running out of ideas. So glad I found this blog. Thank YOu so much!